Lucy’s stomach issues are a result of one of the cancer growths pressing against her small intestine. She has had a stubborn growth in her lower left abdomen since her debulking surgery. That growth has gotten a bit larger. So while she does not have a full mechanical ileus (intestinal blockage due to an object), she does have a partial ileus. The course of action is to keep on the Hexalen and see if it starts shrinking the tumor. This setback is still not a reason to hit the panic button. It’s still too early to tell how this will resolve. We all need to stay positive for Lucy. She has the heart of a warrior and a lot of untapped sisu yet. Her clotting problem seems resolved, which is a huge step in the right direction. Tomorrow she goes in for a two-unit transfusion because her hemoglobin was at 6.4. She has to be at Fairview Southdale at 8:00 am. She did not have to get one tonight because her hemoglobin was over 6.0. It’s nicer driving her home at 1:30 pm than 2:30 am. Lab work shows no gastrointestinal infection, which is a good sign. She is still taking Pradaxa and Hexalen. After two rounds of nausea late last night and early this morning, Dr. Boente tried having Lucy take Compazine every four hours to see if that helped. It didn’t help much. She will be switching to Ativan, which should offer better relief for the stomach issues. Ativan was originally developed to alleviate nausea and has a bonus of being an anti-anxiety drug. We tried a couple of simple home remedies that would not affect her medications. I found some ginger ale that has about 1 oz. of ginger per 12 oz. bottle called Reed’s Extra Ginger Brew at Byerly’s in Edina. Most ginger ales use a tiny fraction of that for flavoring. Ginger supposedly has properties that soothe stomach problems, but it seemed to make her even queasier. I like it so least it won’t go to waste. She tried applesauce for lunch yesterday and wound up with a very rude and quick upset. Apple pectin is another foodstuff that supposedly helps with stomach upset. Ensure and Activia seem to be the only things at this time that don’t cause issues. She tried a couple of unsalted top saltines (sounds like an oxymoron, doesn’t it) and they do not seem to help though she tolerated them well. She is drinking about a pint of Gatorade or Powerade a day to keep her electrolytes up. The warm weather and rain kicked our forsythia bush into gear. Chi Coltrane could have sung about tonight. The Twin Cities set another record high today, the eighth in the past ten days. Late this afternoon a band of thunderstorms whipped through and we received some much-needed rain. Lucy seems to have made a little progress today. She is still having stomach problems and is gamely drinking Ensure to keep from losing any more weight. Her stomach problems seem worse for a few hours after going to bed. She will have some tests performed tomorrow to see what might be the cause. We know it’s not a mechanical ileus (bowel obstruction). She’s had two so far, and they’re extremely unpleasant. She has completed day three of her Hexalen treatment. Eleven more days, then she gets a fourteen-day break before the next cycle. Lather, rinse, and repeat. Tomorrow will also be a bit challenging for me. I have a 2½-hour presentation tomorrow afternoon. Lucy can move around the house OK, but if Minnesota Oncology wants her in for more testing or they need to send her to Fairview for some reason, she’ll need me to drive. Thank you for your time, and keep Lucy in your thoughts. Enjoy the first day of spring (Northern Hemisphere) or fall (Southern Hemisphere) tomorrow! The old Lovin’ Spoonful song from the mid-1960’s is very appropriate for the weather we have experienced the past ten days. Temperatures have run 25°F – 35°F above our average of 42°F. Yesterday was the earliest 80°F reading the Twin Cities has had since official records started in 1871 (but only by six days) and we were flirting with 80°F again today. 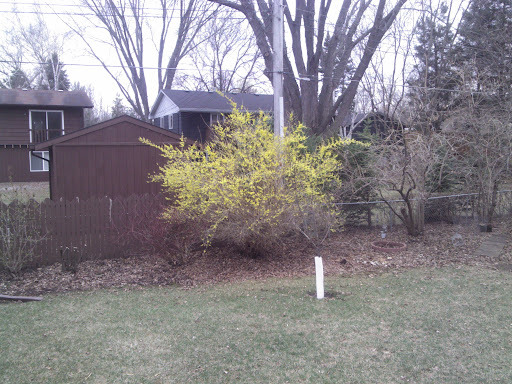 Our forsythia bush has started to bloom even before the squills, snowdrops and crocuses have poked up. The maple trees are quite messy now that they are shedding their red fuzzy flowers because the leaf buds are opening. We have already had a bluebird in the birdbath, the grass is getting green, and the lilacs have leaves forming. Our gentle March breeze isn’t gentle because we were dealing with 20 – 30 mph wind gusts today. Lucy is still having stomach issues. She is managing with Ensure, Activia yogurt, and an occasional Immodium. The stomach noises are quieting down gradually but the noise keeps her awake at night. She still has some stomach cramping, but they are lessening. Her legs are back to normal size and she shows no sign of clot formation. She has tolerated the Pradaxa well. Once her stomach problems abate and she starts walking more, her ankle stiffness will subside. Lucy also started her Hexalen oral chemotherapy yesterday. We’re a bit worried about the Hexalen since stomach problems are a common side effect. It’s only the second day, so it is too early to tell how well she is tolerating it. Diane called yesterday and helped Lucy’s mood improve. She heard from Steve and Julie this morning. For my Northern California cousins, stay warm and enjoy your snow. For our Upper Midwest readers, enjoy summer in March, and for all of you, remember Lucy and I are blessed to have you supporting her! That’s a great question to ask someone doing the limbo dance, but not for Lucy’s hemoglobin level. She had a port draw today and came in at 5.3. We knew she was getting low because her low energy level and pale color. That necessitated an immediate transfusion at Fairview Southdale. We arrived at 6:00 pm. It sounds like she will receive two units, and if all goes well, she’ll go home around 1:00 am. Her first unit started at 9:00 pm and each unit takes between 1½ – 2 hours. Her stomach and intestinal problems greatly improved after the Augmentin completed. Her oncologist suggested she eat yogurt twice a day to help with the noise and slight queasiness. Antibiotics knock the helpful bacteria in the gut for an unfortunate loop. It will take a couple of days for her system to re-balance itself. Lucy’s leg is almost normal sized again. We will have to lotion her leg a couple of times per day to help soften the skin. That will help with the tightness she feels. Both ankles are much less swollen and loosening up. Her walking speed is increasing though she still needs the walker. At this point, she has not started her Hexalen yet (the oral chemotherapy). I think she wants to start it tomorrow depending on how her digestive issues are doing. The extremely warm weather we are experiencing has been very beneficial to Lucy’s gardens. The east side gardens have irises, tulips and daffodils about 3″ tall. Her blue flax is back and some of it is 6″ tall already! No signs of the sqills, snowdrops, or crocuses yet, but they are buried under several inches of leaves. The lilacs and maple trees have leaf buds on them. She also has sedum popping up. A few of the forecasts are hinting at 80°F a couple times in the five-day forecast. That will drive the frost completely out of the soil. We hope you are enjoying decent weather where you are. Thank you for making the time to support Lucy! Lucy’s still having some stomach issues. She has had stomach problems with every oral antibiotic she has taken even before her cancer. The Augmentin is done Thursday morning. She called the doctor and was told to take some Compazine for her stomach upset. The stomach problem might take a few more days to resolve. As such, her oncologist extended her disability to April 5th. She was originally scheduled to go back to work this Friday. That was disappointing for her, too. Lucy’s legs are almost back to normal size. Her ankles are still somewhat stiff but are getting better. She still needs her walker because of her ankles, but her movement speed is getting faster. Her Hexalen will arrive tomorrow. It sounds like she will be taking five capsules per day, but we can spread the dosage throughout the day. Lucy’s sisters have been very supportive the past couple days. I ran into a long-time (I hate the word old in this case, because he isn’t even if I am!) friend yesterday and had a nice talk with him. Thanks Dave, you don’t know how much you helped! And thank you to everyone who sent emails of support!